I call my sister Jennifer nearly every morning. At least every weekday morning on my way to the office, she’s getting her family off to school, work, and school. Today we were commiserating over the latest dramas and challenges of our lives. Both, have to do with our children. My son is 18 and we’re entering a season of his life that leaves me dumbfounded. Her son, is 7 or 8 ish. He too is entering a season of his life that leaves her dumbfounded. And in this conversation it hit me. Like. A. Ton. Of. Bricks. Be on the look out, because when it’s quiet…too quiet, are the times as parents we need to be most vigilant. Funny right? 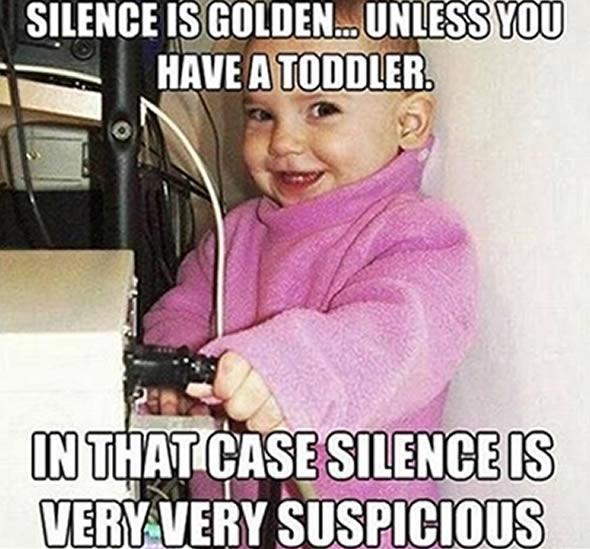 As parents, we often say, the only time we worry about our toddlers is when they’re quiet. So I stopped, and almost dead in my tracks kind of stop and thought… that’s as true now when my young man is 18 or when he was 14, or 10, and even 3. When it’s too quiet, is when as parents we should be most on guard. We live in a world that is ever changing and growing more crazy by the minute. The risks get greater and the stakes are higher. Jennifer and I talked about “who’s job is it anyway?” And I think I’ve decided while the “job” whatever it may be is ultimately belongs to my son, when I signed up as Mom that made me a part of the deal. It’s a commitment that began when I realized I was pregnant and a commitment I will honor until my last breath. It is a special gift to be a mother. For the mothers out there, enjoy it. Enjoy the easy breezy times, the times when you don’t know which end is up, the times where your wonder how on earth this child is yours for the good and for the bad. Motherhood is quite possibly the most challenging and probably most rewarding task you’ll ever take. This entry was posted in Life and tagged Caution, Mother's Day, Motherhood, quiet, toddler. Bookmark the permalink.